You always expect a bit of offbeat, quirky element to any indie flick, but I have to say, this is one of the stranger ones I’ve seen recently. Kat Dennings (herself a darling of the indie scene) plays Caroline Wexler, a high school girl who recently moved to a small town where it just so happens that A) a toxic industrial is raging out of control not far from town and B) a serial killer wearing a white suit is stalking teenage kids. Seems like a stretch, but okay, I’ll go with it. All the usual tropes are there: embarrassing, awkward parents, stoner outcasts, and judgemental peers. Most of this just serves as a framework for Caroline’s progression as a character. She is obviously intelligent and creative, feeling stifled by this claustrophobic little town. Things get really strange, however, when she enters into a sexual relationship with her English teacher (why does it always have to be the English teacher…why not the frumpy guy who teaches shop?). Josh Lucas makes a bit of a departure here, playing the lecherous, emotionally damaged Barry Anderson. I’ve seen movies before where a student becomes enamoured with a teacher, and some have even involved this level of sexually explicit love scenes. But what got me was the way the film was almost dismissive of the fact that he was breaking the law. He is basically portrayed as one corner of a love triangle, and any humor dealing with his being a teacher was done kind of wink-wink, tongue in cheek. Some of it wandered a bit too far into ick-territory. To tell the truth, I’m not actually sure if I liked the film. It hooked me quickly for sure. When I sat down to watch it, I wasn’t really in the mood for indie-angst, but the characters and voice-over narrative drew me in. Even when the movie started to get weird and fray at the seams, I stayed with it. I think that it will probably divide viewers. Some will appreciate the absurdity that gets injected into character relationships in subtle ways; others will think its overblown pap made by people who need a bit more time to hone their chops. Like many great indie films, Blue Valentine built its success on word-of-mouth buzz. While studios generally rely on hucksters in suits to push the latest cookie-cutter sequels down your throat, indies will spend very little on marketing, and allow the film to speak for itself. And while these sorts of films are sometimes divisive, and not for everyone’s taste, when they do carve out a niche audience, it tends to be loyal to the core. Ryan Gosling and Michelle Williams are slowly building careers as “stars” of alternative cinema. They choose projects with an edge, that tells stories from the margins, and are unafraid to break taboos. This film is a love story that understands love is not always forever; it can be ugly, full of scars, and can end without sunsets & smiles. The lead characters in Blue Valentine are Dean and Cindy, a pair of damaged outcasts who find each other in their own random and unlikely way. The story is constructed around dual narratives, one at the beginning of the relationship, and one as it is falling apart. These juxtaposed stories show a contrast between hope and despair that exists within the relationship over time. 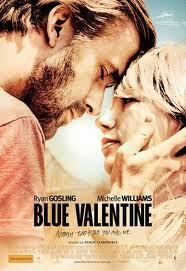 I liked Blue Valentine because of the things it is not: slick, taut, compact, and neat. It is the opposite of these things, and has a sincerity that is often lacking in many studio films. There is more truth in a few short scenes of interaction between Gosling and Williams than most films pull off in 2 hours. 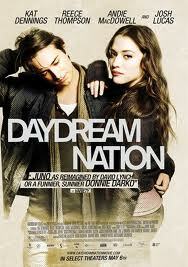 Kudos to director Derek Cianfrance for delivering such a refreshing take on the “relationship” movie. 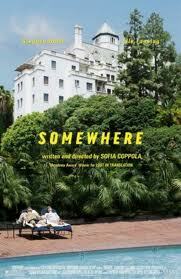 “Somewhere”, written and directed by Sophia Coppola, comes off as a self-indulgent, meandering, vanity project. Essentially, it is meant to convey Coppola’s own disdain for the “Hollywood lifestyle” that she endured while growing up the daughter of her famous father, Francis Ford Coppola. The film takes place over a period of perhaps a week, during which time the main character, Johnny Marco, a Hollywood actor, takes care of his estranged daughter while she visits. During the film, we have glimpses into the hollow existence of this actor, his meaningless sexual exploits, and the mundane press conferences. The way this is handled by Coppola is to beat the audience over the head with this message. Someone needs to pull her aside and explain to her all about the concept of “less is more”. Watching the movie was excruciatingly at times. In one scene, Coppola filmed lead actor Stephen Dorff for two full minutes doing nothing but sitting in a chair with a facial mould. No conversation. Just him breathing through holes in the gunk. Most of this minutia-obsession was foreshadowed in the first three minutes of the film, which consisted of Dorff driving his Ferrari around a closed track. The film style was something akin to watching hidden cameras in someone’s home or vehicle. The only hint of conflict or crisis comes in the final 15 minutes, and is left mostly unresolved. Devoted Coppola fans may find grains of enjoyment in her latest film, but I suspect a strong majority of people who watch this are going to find themselves wishing for the previous 100 minutes of their life back. “Let Him Be” presents an interesting premise: What if John Lennon had survived his assassination and was living on a dairy farm in northern Ontario. As strange as it might sound, the story has a hook. The results are a bit mixed, however. The film begins with a pair of amateur filmmakers (who are also romantically involved) tracking down the man one of them suspects is John Lennon. A grainy image of the man is lifted from an old Super 8 cassette that was found randomly at a yard sale. With only this, and a rough idea of the location, the two begin asking around if anyone had seen this mystery man. Some parts of the film, especially the performances by the two filmmakers, leave something to be desired. The acting from them tends to be a bit over-the-top generally. Most of their scenes, like the film overall, are shot on hidden cameras, which only seems to emphasize their lack of acting skills. On the upside, the rest of the cast, though unknown, is quite good. Special kudos to Mark Staycer, who plays Noel Snow (aka John Lennon). The scenes of him bantering with his friend and housemate Stanley are incredible, and conversations are written to give just enough hint that he COULD be John Lennon, but never confirm it in any way. And the scenes of him jamming with his band of locals drip with authenticity. Watching this movie, I found it easy to imagine that I was watching a long-lost version of the music icon. While not without its flaws, “Let Him Be” is worth watching simply for the way this premise is conveyed.